Cauliflower seems to be the new IT vegetable these days. I keep hearing about so many different ways to make it. Normally I just roast it in the oven with some olive oil and salt but I wanted to try something different. 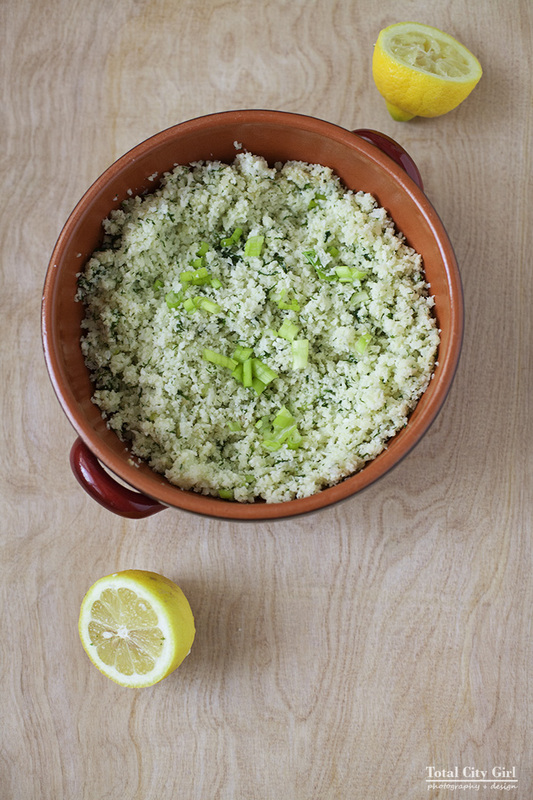 I’ve been intrigued by the idea of cauliflower rice and couscous.. Have you heard about this? 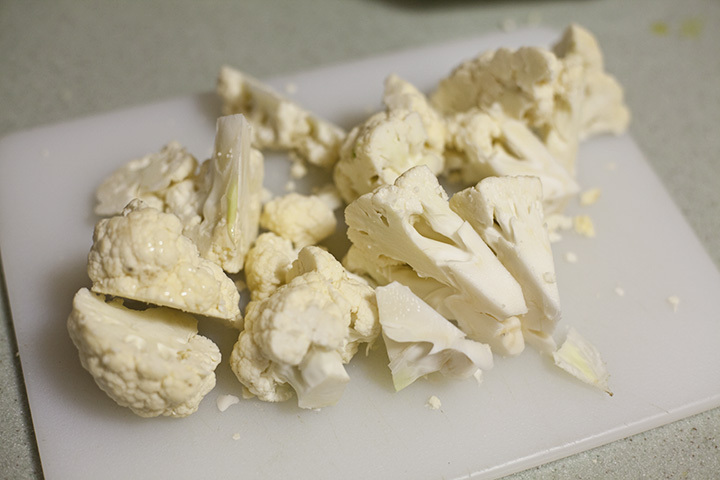 Start with 1/2 of a head of cauliflower – rinse and pat dry. I did this next part in small batches because I noticed it was getting stuck if there were too many pieces in at once. 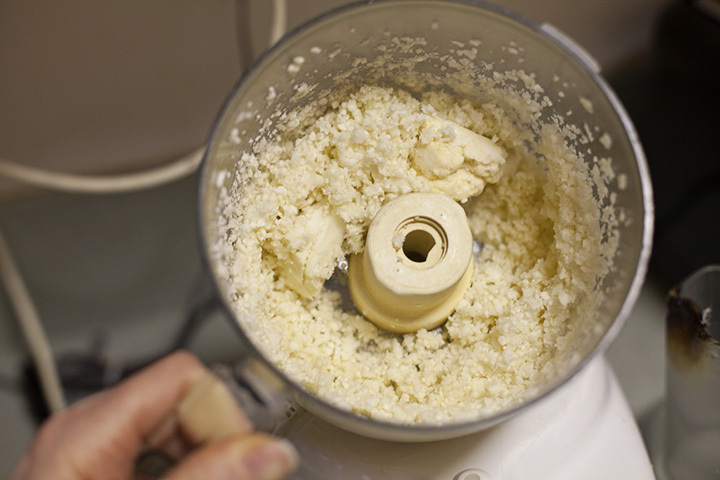 Put a handful of the cauliflower pieces into the food processor. 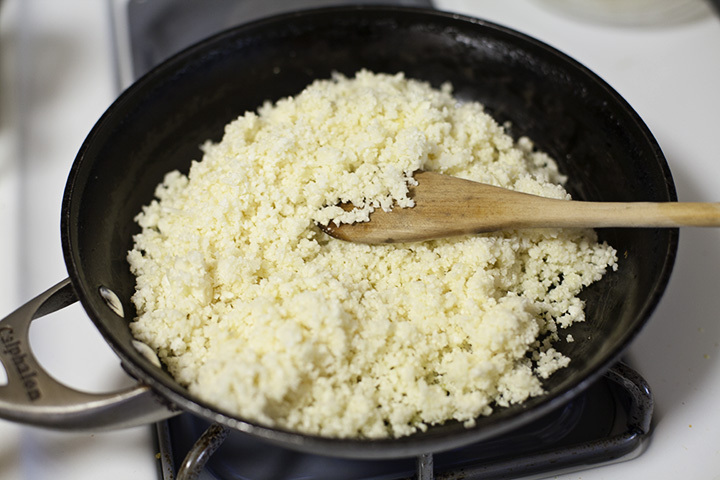 Pulse it a few times until it resembles rice or couscous. Empty it out and repeat until all of the cauliflower is whizzed up. In a pan, sautes 1 clove of chopped garlic with 1 tablespoon extra virgin olive oil. You want to cook it for about a minute. Watch ti because garlic cooks and burns really quickly. 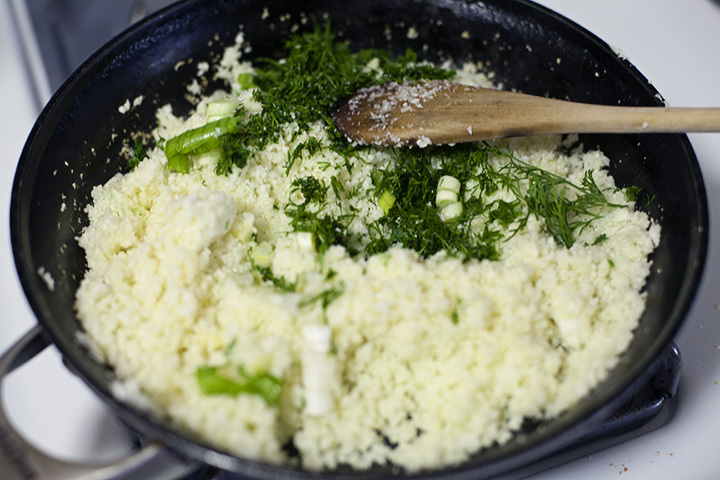 Add the cauliflower “couscous” to the pan and mix around a bit. 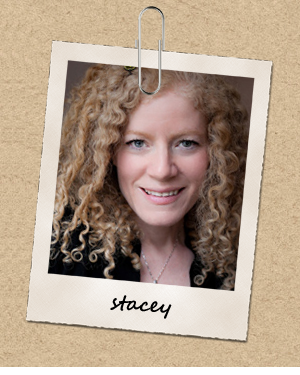 You’re basically heating it up. 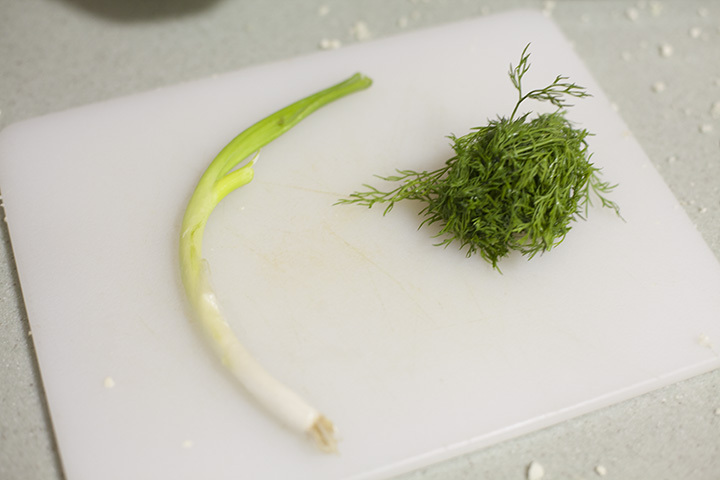 While it’s cooking, get one scallion and a tablespoon or so of fresh dill. Chop them both up and add to the pan. Mix around and add 1/2 teaspoon kosher salt. Squeeze in the juice from 1/2 lemon. 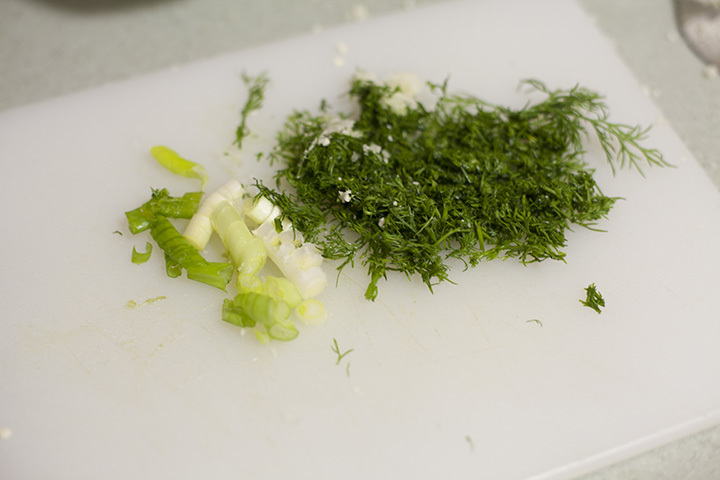 Mix again, taste for seasonings – add more salt if necessary. You’re done! Only takes a few minutes to prepare and cook! 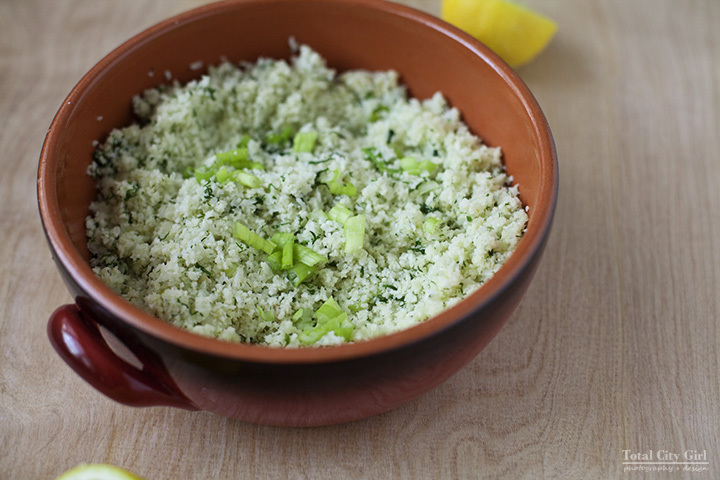 It’s really crazy how it feels exactly like couscous in your mouth. 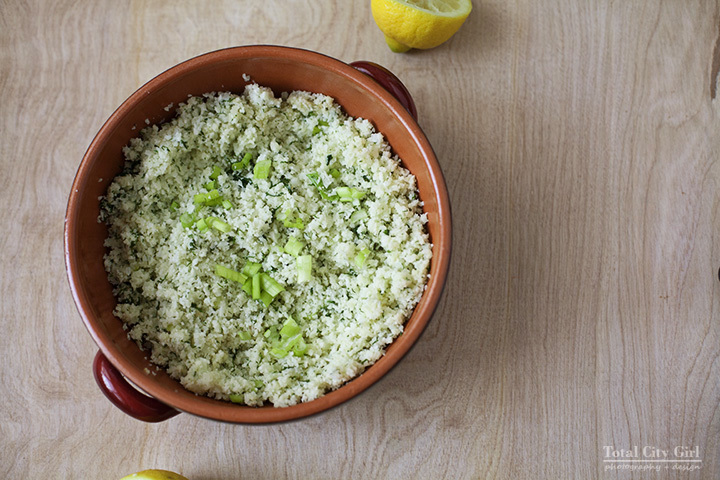 It’s not even an overpowering cauliflower taste – your brain WANTS it to taste like couscous! I’m happy to report that my family liked it so I used the other half of the cauliflower and made it again for lunch today. You can also try eating it raw. In that case I would skip the garlic. 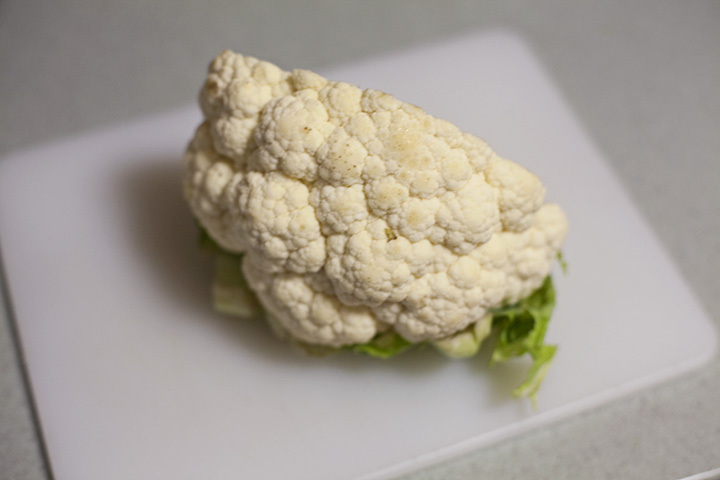 I think the raw version would be interesting – the cauliflower would just be a little grainier. Makes for a great lunch or side dish for dinner. 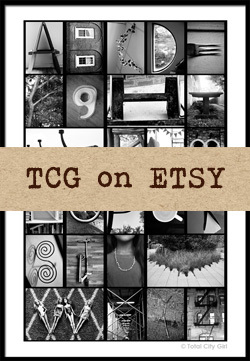 Let me know what you think and if you’ll try it.